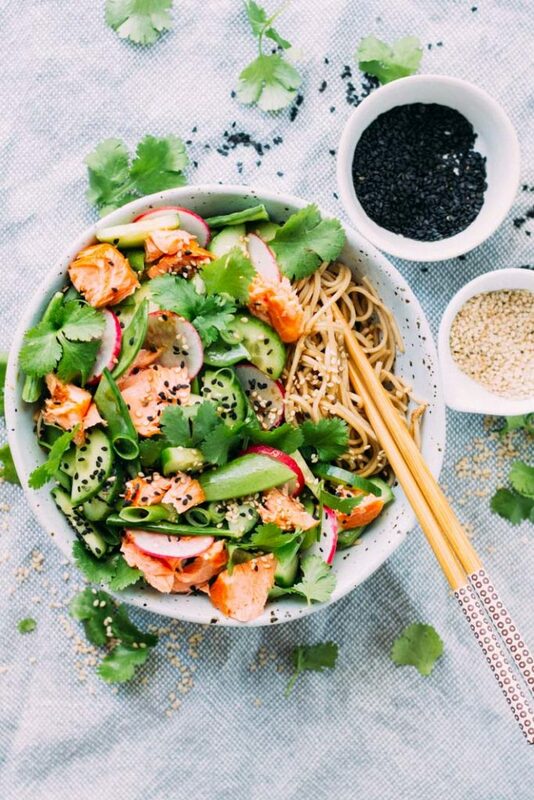 An easy, tasty and healthy salad that’s full of delicious smokey salmon, crunchy greens and nutty soba noodles covered in a light Asian inspired tamari dressing. Ready in less than 20 min! Jump to recipe. 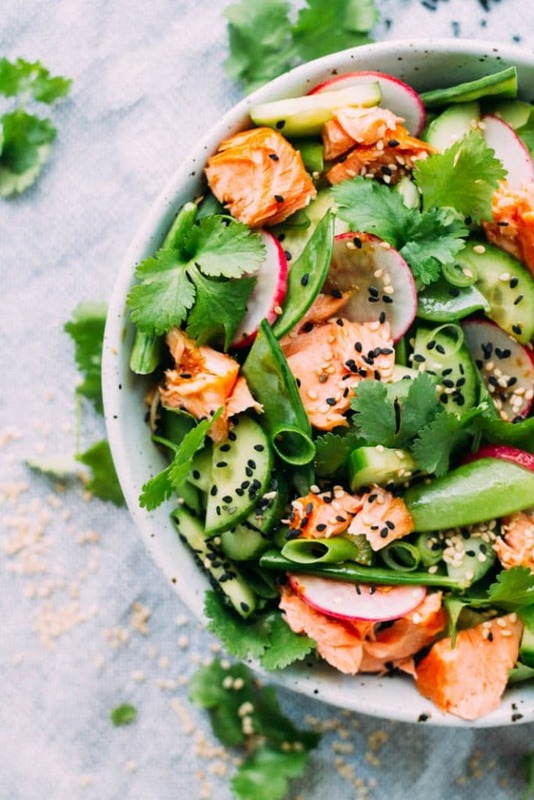 I came up with this recipe almost a year ago when I had a momentary lapse of sanity and decided that I would do one of Gwyneth Paltrow’s elimination diets. Whether you’re into steaming your you-know-what’s-it or not, whether you love her or hate her we all have to admit she is full of energy and looks pretty darn awesome for mid-40s. Well my brain decided that if GP is that amazing and she does these elimination diets then Kate Wright will also be that amazing when she does them too. Before you laugh yourself silly at me let me just add that I was quite sleep deprived at the time from two little toddlers and I am such a sucker for good marketing, I’m what you call a marketer’s dream (so is my four year old son who now can tell you all about the air fryer after I caught him watching informercials on TV)! Anyways…it was a fail. Complete fail….diet that is, not that salad, that’s freakin’ awesome! 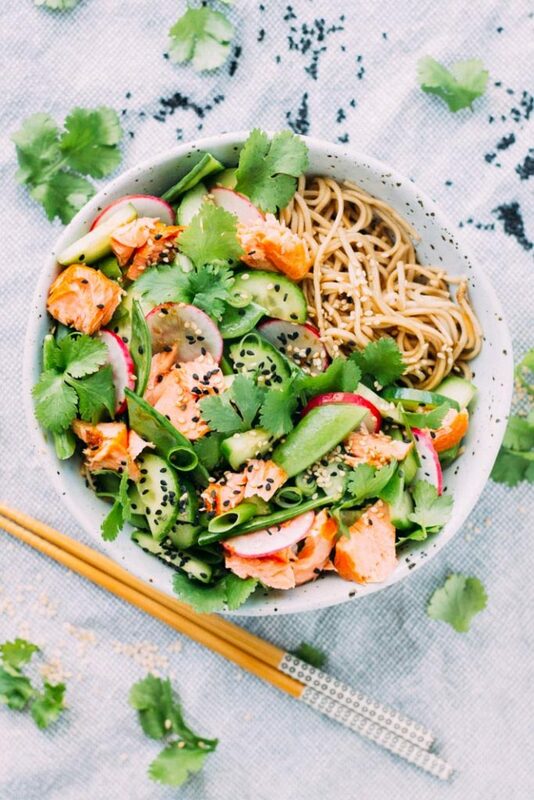 While I was on the diet (for the three days I made it through) I made this for salmon and soba noodle salad dinner one night. I wasn’t allowed soy sauce but was allowed gluten-free tamari, I wasn’t allowed any wheat but buckwheat, which soba noodles are made from, were okay. This salad tasted amazing! I ate almost two massive bowls full in one sitting. I couldn’t get enough of the flavours – salty tamari, spicy ginger, garlic creamy salmon, nutty sesame and crunchy greens. I also couldn’t get enough of the noodles, they are a little nutty and have far more flavour than your standard egg or rice noodles. Turns out I really am a true failure when it comes to diets (which I am totally cool about because diets are so not cool), I never actually read the noodle packet and while they do have buckwheat in them, they are also 50 percent wheat! Whoops. So while I didn’t come away from my three days on the diet (well actually less because of my little digression with soba noodles) embodying GP I did come away with this salad recipe which I have been making regularly since. 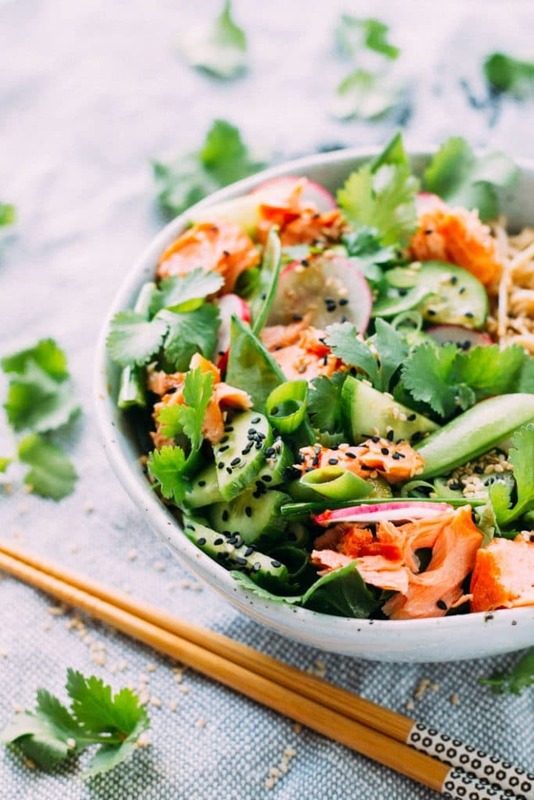 It is so easy to throw together and while it doesn’t quite meet GP’s standards it is pretty darn healthy and super duper tasty, and ready in less than 20 minutes! I like to follow it up with a big slice of Salted Caramel and Hazelnut Slice just to remind myself I’m not on any silly diet. Everything in moderation right? 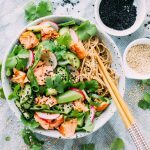 An easy, tasty and healthy salad that's full of delicious smokey salmon, crunchy greens and nutty soba noodles covered in a light Asian inspired tamari dressing. Ready in less than 20 min! Bring a large pot of salted water to the boil. Add soba noodles and cook for 4 minutes (or according to directions on the packet). Drain well then transfer to a large bowl. Reserve about 3-4 Tbsp of the dressing then add the rest to the warm soba noodles and mix well to coat all the noodles. Allow to cool. 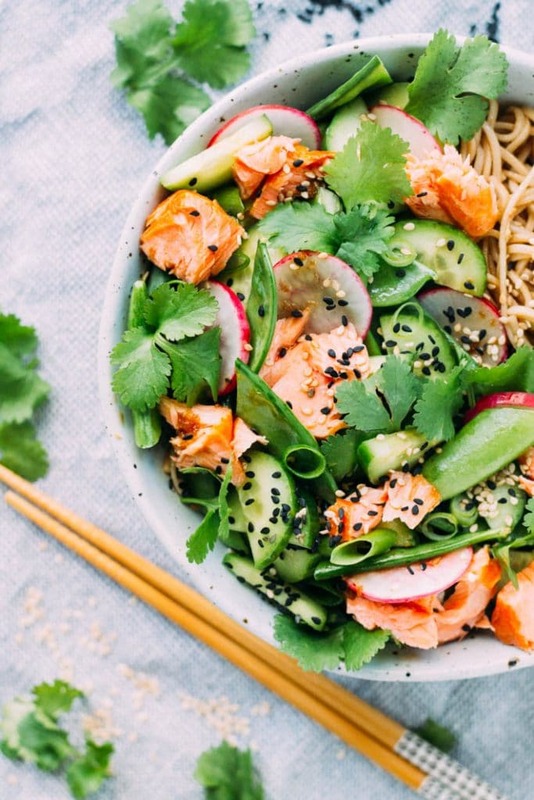 Place cooled noodles in a serving bowl with cucumber, sugar snap peas, snow peas, spring onions, radishes and coriander. Toss to combine. Gently flake over smoked salmon. Drizzle over remaining dressing and sprinkle over sesame seeds. Serve immediately. Hello my dear Kate!! I feel like I have talked to you in a very long time!! Hope you are doing well! 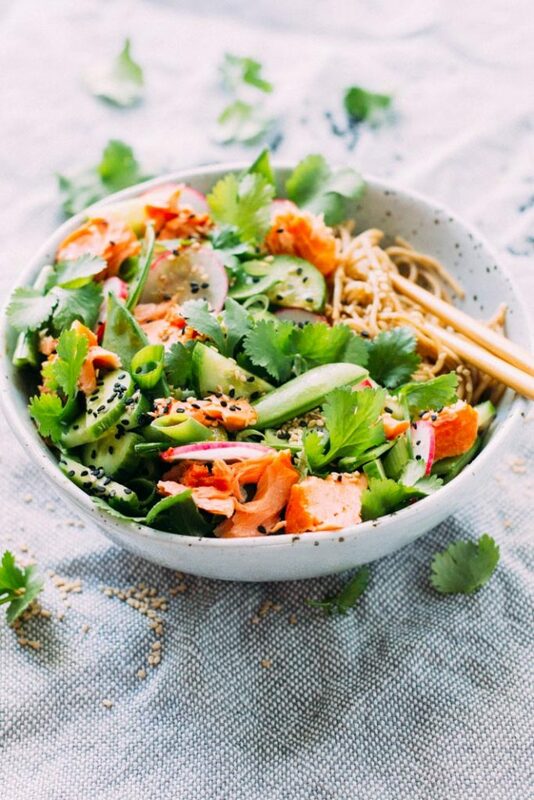 🙂 This Salmon, tamari and soba noodle salad looks so tasty, I wish could eat it for my next meal! I am pinning this to my Seafood Recipes board right now! Likewise!! I have been absolutely terrible at visiting my own blog, yours and all my other favourites in the last couple of months. We have been selling our house and moving and unfortunately the blog had to take a back seat. I do hope you’re well! Looking forward to getting back to visiting your blog regularly again.